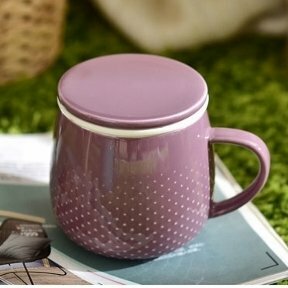 Porcelain mug in four colors. This 12 oz. makes it easy to make your favorite tea at work or school or on a trip. Measure your loose tea in the infuser, pour over the hot water, cover with the lid. When the tea is ready, remove lid and infuser. The infuser can then be place on the overturned lid for draining. Easy!